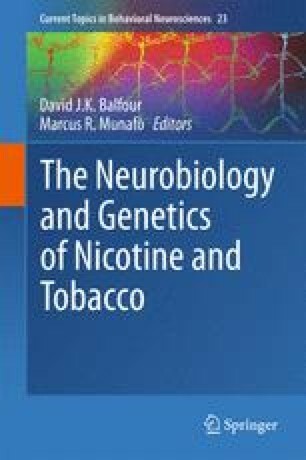 This chapter summarizes genetic factors that contribute to variation in nicotine pharmacokinetics and nicotine’s pharmacological action in the central nervous system (CNS), and how this in turn influences smoking behaviors. Nicotine , the major psychoactive compound in cigarette smoke, is metabolized by a number of enzymes, including CYP2A6 , CYP2B6, FMOs, and UGTs, among others. Variation in the genes encoding these enzymes, in particular CYP2A6 , can alter the rate of nicotine metabolism and smoking behaviors. Faster nicotine metabolism is associated with higher cigarette consumption and nicotine dependence, as well as lower quit rates. Variation in nicotine’s CNS targets and downstream signaling pathways can also contribute to interindividual differences in smoking patterns. Binding of nicotine to neuronal nicotinic acetylcholine receptors (nAChRs ) mediates the release of several neurotransmitters including dopamine and serotonin . Genetic variation in nAChRs , and in transporter and enzyme systems that leads to altered CNS levels of dopamine and serotonin , is associated with a number of smoking behaviors. To date, the precise mechanism underpinning many of these findings remains unknown. Considering the complex etiology of nicotine addiction, a more comprehensive approach that assesses the contribution of multiple gene variants, and their interaction with environmental factors, will likely improve personalized therapeutic approaches and increase smoking cessation rates. We acknowledge the support of the Endowed Chair in Addiction for the Department of Psychiatry, CIHR grant TMH109787, NIH grant DA 020830, Centre for Addiction and Mental Health and the Canada Foundation for Innovation (#20289 and #16014), the CAMH Foundation, and the Ontario Ministry of Research and Innovation.